People move into residential care for a variety of reasons but for each person it is a major life event. Wherever possible, it should be the result of an individual's own informed decision but this may not always be the case. Some come direct from hospital because a decision to discharge the patient into a supported environment where care is available has been made on the basis of assessment. Some may come in as the result of decisions made by their relatives or as a result of a crisis. The clinical and other care needs of individuals will vary substantially. In many cases, residents will have been assessed by their local authority social services in consultation with medical and nursing colleagues as requiring residential home care and some of them will be paid for in part by the local authority under the NHS and Community Care Act 1990. Others will be paying for themselves. A prospective resident is likely to be anxious that the decision is the correct one, however it was arrived at. Coming into Mellor Nook may mean a move away from a familiar area, away from neighbours and friends. It almost certainly means a move into smaller accommodation and the giving up of many personal possessions. Moving into residential care may be occurring at a time of other significant change in the person's life of crisis or emergency. That change may be due to the loss of a partner or carer with all the accompanying grief which that will entail. To be moving into care can itself sometimes feel like a bereavement. Individuals should make their own informed decision to come into Mellor Nook. Other non-residential options should have been considered for example, packages of care organised after local authority assessment by a care manager which enable both health and social care services to be delivered in the individual's own home. · Why is life difficult? · Why is care needed? · Are there any particular worries and anxieties ? · Are these to do with housing, health, disability or other crisis ? · What are the preferred options ? · Have any been tried? · What other circumstances are affecting the situation (for example, are relatives involved and if so are they trying to influence the individual) ? All people have the right to fund their own stay or seek an assessment of their needs by the local authority social services and this should form part of the decision-making process. Under the Carers (Recognition and Services) Act 1995, their carers also have the right to be assessed by the local authority. The reasons for deciding to move into care may be varied. Some people may feel they have no other option because of their current circumstances. Some may be faced with the decision suddenly; others may have planned the move for some time. · inability to manage a large house and garden. The reasons why people come into Mellor Nook have changed in recent years. More are coming in because of failing health and increased dependency than for social reasons. This has consequences for the levels of care required in homes. Managers and staff understand the varying reasons why, and in what circumstances, residents have come into care. Some individuals may need more support than others in coming to terms with the major change in their lives and the home is sensitive to this. In all circumstances, however, new residents are made welcome and supported through the period of adjustment which all will experience as newcomers. Increasingly people moving into Mellor Nook come via the route of a social services-led assessment under the NHS and Community Care Act 1990. They may have been the subject of a joint assessment between social services and the health service prior to hospital discharge. The social services may also have instituted an assessment of their needs while they were still living in their own homes. There may have also been an assessment of their financial means. · eating, going to the toilet; bathing and personal hygiene. Copies of the assessment are given to Mellor Nook as part of the admission process and form the first stage of care planning. Wherever possible, this begins before the person moves into the home. Planning starts as early as possible. 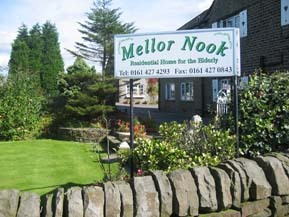 People planning to enter Mellor Nook are able to visit the home Similarly, it is desirable if so wished that the manager of the home should visit potential residents to establish a personal relationship, gain information about their way of life and advise them about what possessions can be taken with them into the home. There are a number of organisations which can offer advice to people thinking of entering care. Information about them should be made available by social services/work departments, at GP surgeries, clinics, citizens advice bureau, community health councils (England and Wales), local health councils and councils of social service (Scotland), health and social services councils (Northern Ireland) and other advice agencies. · Extra services which are charged for separately . · Information regarding the home's policy on pets. The first six weeks is a trial period to allow time to see how well the new resident settles in. Many people will come into care as the result of a crisis or direct from a period in hospital. Relatives or others concerned with their welfare should be made aware of the nature of the trial period. Residents coming from their own homes should be careful to delay selling their houses or terminating their tenancies until they are certain they want to remain in Mellor Nook. During the trial period, the suitability of the arrangements are discussed fully with the resident and whoever is the individual's key supporter (relative, friend, social worker). The possibility of transfer if the arrangement is turning out to be unsuitable may be considered. Review decisions are recorded and implemented. Once the individual has become an established resident, a programme of regular reviews to monitor progress and to ensure the resident is satisfied with the home are agreed and their purpose explained. These reviews will become part of the care plan. A short stay may be planned for convalescence, rehabilitation or respite. In some cases, some people's health may improve so that they are able to return home. The aim of convalescence rehabilitation or respite (which is available to all residents) is to retrieve a person's functioning and to maintain it at its highest level. 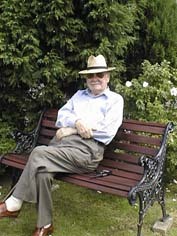 Older people who qualify for statutory funding retain the right to choose which home they would like to live in even though the social services department is partly funding their care. The department will put an upper limit on the level of fees it is prepared to pay, If the resident wishes to come in to Mellor Nook which has a higher fee level this is still possible provided that the difference is guaranteed (usually by a relative or another organisation). This difference is referred to as (top up). Where residents are paying full fees themselves and are likely to continue to do so for a minimum period of two years it is not necessary for the statutory services to be involved. However, if a resident becomes in need of financial assistance after the minimum period of two years social services should be approached This may also be available through independent organisations which specialise in helping people find suitable residential care, through welfare organisations or advice agencies. Prospective residents should also make clear their own financial position. · Take account of the person's wishes and lifestyle. · Assess the residents needs. · Has clear arrangements about the roles family and friends have in the care and life of the resident. · Not deceived or misled into entering care.